Wabasha, Minn. — More than 180 volunteers drove and hiked off into the blufflands on January 16, looking for golden eagles, during the 12th annual Wintering Golden Eagle Survey sponsored by the National Eagle Center. They counted 147 golden eagles. Last year they counted 134. This year the volunteers also counted 1,509 bald eagles, compared to last year’s 1,773. Golden eagles hunt rabbits and other small animals. Bald eagles eat mainly fish, although they also scavenge carrion and hunt small mammals and waterfowl. The high number of bald eagles shows that plenty of food was available in the hills this year and last. When food is scarce, bald eagles stay near open water on the river, where they can fish. The survey tracks the birds’ migration patterns and habitat preferences. The birds are regular winter visitors here, although they don’t usually stick around to breed. Washington, D.C. — Old tanker cars that are more likely to rupture on impact contribute to explosive railroad accidents, but the rails they travel may also be a problem. The Federal Railroad Administration will take a look at rules governing worn rails in 2016. After several fiery derailments in 2012, the FRA asked the Rail ­Safety Advisory Committee to create new standards to reduce risky rails. A 116-person working group composed of government and industry experts tackled the problem in 2012 and 2013, but only agreed on voluntary guidelines and no new regulations. Railroads argued against regulation because different railroads have different standards and because wear varies depending on how much weight a rail route carries; whether conditions are wet or dry, hot or cold; and whether the route goes through mountains or many curves. Cedar Rapids, Iowa — Former Effigy Mounds National Monument superintendent Thomas Munson pleaded guilty to embezzlement on January 4, for taking two boxes of prehistoric human remains from the monument’s collection in Marquette, Iowa, in 1990 and hiding them in his garage in Prairie du Chien, Wis., for 20 years. Munson agreed to pay $108,000 in restitution to cover the costs of the government’s investigation, publicly apologize to tribes with probable descendants of people who lived there, complete 100 hours of community service, and serve a year’s probation and home detention with confinement on 10 consecutive weekends. The bones were from more than 12 human skeletons that had been excavated from archeological sites at the monument decades ago. When they were recovered in 2011 and 2012, many were broken and fragmented beyond recognition. Rock Island, Ill. — If you plan to tour Arsenal Island — the Mississippi River Visitor Center at Lock and Dam 15, National Cemetery, Arsenal Museum, Davenport House or any of the other attractions — be prepared for an enhanced security screening. As of December 1, visitors must first check in at the new Visitors Center at the Moline gate to get a pass (enter from River Drive in Moline). You will need to show a photo ID (for example, a valid driver’s license or passport) and agree to a criminal background check. The process could take several minutes. You will not be able to get a pass if you are a foreign national (unless you are visiting on official business) or under 18 and not accompanied by an adult. If the criminal background check isn’t favorable, you will also be denied access. Trout Unlimited (TU), an international conservation organization, has released its “2015 State of the Trout” report detailing the status of 28 species of trout and char native to 38 of the 50 United States. The report says only 25 species remain, with 13 found in less than a quarter of their historic habitat. Trout need clean cool water to survive. Land development, over fishing, water pollution, erosion from early farming practices, poor logging and livestock grazing practices, climate change, and the introduction of non-native species have led to the extinction of three trout species. Six species are currently listed as either threatened or endangered. The report notes regional progress. In the Driftless Area, a 24,000 square-mile area of Wisconsin, Minnesota, Iowa and Illinois that straddles the Mississippi River, TU has restored more than 450 miles of streams in the last 25 years. Many projects were on private land with angler access easements. Fish counts before restoration were from 200 to 300 fish per stream mile. After restoration they increased to over 2,000 fish per stream mile. Moline, Ill. — The year 2015 was more productive than ever for the nonprofit river cleanup organization Living Lands and Waters (LLW). In his annual year-end letter, founder Chad Pregracke counted more than 200 cleanups completed in 12 states and a record 64 events in 56 days in three states. LLW also expanded operations to the Tennessee River and added three new pieces of equipment to its fleet: a garbage barge, mini-towboat and an excavator. La Crosse, Wis. — Fish researchers with the La Crosse Fish and Wildlife Service office finally captured and tagged invasive Asian carp in Pool 16 (Muscatine, Iowa), after failing several times in upstream pools earlier this year. Using surgical gear and several hundred yards of gillnets, the team of three went out one windy, cold week in October and caught six Asian carp — four silver carp and one hybrid Asian carp. They implanted acoustic transmitters in them before releasing them. The purpose of the tagging is to follow the fish as they move around, to learn where they live and to aid future efforts to control their spread. Similar research has been done in Pools 17, 18 and 19. Guttenberg, Iowa — The mudpuppy is a rare aquatic salamander species that lives in and near the Mississippi River, among other places, but is rarely seen. Mudpuppies can grow to 16 inches long, but they live underwater and are very good at hiding under rocks, in debris and near wet places. In July 2008, a DM&E train derailed after a boulder dislodged by heavy rain tore up some track near Guttenberg. Four locomotives sank in the river and leaked oil for several days. When biologists found a dead ­juvenile mudpuppy, they obtained some of the $625,000 settlement to conduct a mudpuppy study. Read more about mudpuppies in a story from May-June 2006 Big River. Modes, who recently finished MFA studies in digital and new media at the University of California in Santa Cruz, was inspired by Harlan Hubbard’s Shantyboat: A River Way of Life, a book that chronicled the author’s five years on board a shantyboat in the 1940s. Modes built his own shantyboat in 2012 using a chicken coop and a small barge. He began collecting and recording Mississippi River stories during the summer of 2014. Modes hopes to chronicle stories from several American rivers and combine them into an exhibition that will include portraits and video biographies of people he interviews, in addition to an interactive web documentary and a research archive of the collected stories. Details of Modes’ journey and project are on his website. Twin Cities media artists Monica Haller and Sebastian Muellauer joined Modes at Guttenberg, Iowa, and traveled downriver to Dubuque while conducting their own river research — mapping the sounds of the Mississippi from the headwaters to the delta. They plan to bring the archive of sounds back to the Twin Cities to exhibit in a “listening station” on the banks of the river. Haller is listening to and recording underwater river sounds using a floating drone, called ORB. Muellauer built the drone out of a large inner tube — the center is the electronic hub of the robot buoy, which suspends under- and above-water audio recording devices, a camera and water sensors to record and transmit river sounds for archival purposes. Access to these sounds will be available as a “listening station” located long-term at an institution along the Mississippi, or short term at several places along the river. Museums and organizations interested in participating are invited to contact Haller. Des Moines — You can now see five decades of Iowa aerial photos at the Iowa Department of Natural Resources (DNR) website, thanks to the Iowa Historic Digital Aerial Photo Project, funded in part by grants from the state’s Resource Enhancement and Protection program (REAP). In 2009 and 2011, Historical Resource Development Program grants from REAP helped the DNR’s Geographic Information System Section obtain photos from archives across Iowa and the nation. For more than eight years, from 2004 to 2012, the photos were scanned and matched to their actual locations, to produce images of the entire state. Changes in the Mississippi River and its shoreline development are reflected in the photos. Check out the 1930s photos to view locks and dams in various states of completion. To see them, zoom in to the part of the state you are interested in. Use the “Basemaps” tab at the top of the page to access a pull-down menu. Click between the different maps in the pull down menu to make decade-to-decade comparisons of Iowa’s landscape. Joliet, Ill. — A new type of lock has been proposed to control the spread of invasive Asian carp and other unwanted species from the Mississippi River basin into the Great Lakes. The Great Lakes and Mississippi River Interbasin Study (GLMRIS) suggests that a “flushing lock” could be constructed on the Illinois River at the Brandon Road lock near Joliet. The lock, located downstream of the confluence of the Des Plaines River and the Chicago Sanitary and Ship Canal, would push water from the lock back in the direction it came from, thus flushing back fish that might have gotten into the lock chamber. In May 2015, the Corps released a scoping document for an Environmental Impact Statement (EIS). It anticipates releasing the draft EIS in late 2016. The scoping summary can be found online. Dubuque, Iowa – In early August, the city of Dubuque, Iowa Department of Natural Resources (DNR), Iowa Natural Heritage Foundation and Friends of the Mines of Spain celebrated completion of the 52-acre E.B. Lyons Interpretive Area Addition adjacent to the Mines of Spain State Recreation Area, a sprawling park south of Dubuque along the Mississippi River. The project included construction of an accessible trail from the current E.B. Lyons Center to a new trail along a tall-grass prairie and overlook, the State Tree Woodland Walk, two new parking lots, a shelter, restrooms, a new DNR maintenance facility, kiosks and interpretive signs. Scenic views, including an area on the park’s north side designated as the Catfish Creek State Preserve, were improved, native vegetation near the center was restored and runoff was reduced, improving the water quality in Catfish and Granger creeks. More than 250,000 visitors explore the Mines of Spain each year. The park boasts several official designations: It is a state Watchable Wildlife Area and an Important Bird Area — more than 213 species have been identified there. The Mines of Spain is part of the National Recreation Trails System and a National Historic Landmark, with 252 known archaeological sites. Minneapolis — In September, Augsburg College will send 20 students, faculty and staff downriver from Lake Itasca headed to the Gulf of Mexico in four voyageur canoes. The group will study environmental, biological and political subjects, and delve into individual research projects along the way. Students will also attend town hall meetings and meet with environmental organizations. Dubuque, Iowa — A University of Dubuque student’s research confirms that Dubuque’s waterways continue to be affected by historic lead mining. “The effects of mining are still existing, and they will forever be existing,” according to Kyle Leytem, a senior environmental science major who spent the summer of 2014 exploring Dubuque-area waterways measuring lead content. His research showed higher levels of lead in the Mississippi between Dubuque and Bellevue, Iowa, than in other sections of the river. Lead mining in Dubuque began on a small scale with the Native Americans and was a major source of income for settlers in the early and mid 1800s. At one time, an estimated 80 percent of Dubuque’s population mined lead. Early lead miner and historian Lucius H. Langworthy reported that between 40 and 60 million pounds of lead from Dubuque area mines were exported annually from 1833 to 1856. Over time, lead mining and the after effects of abandoned mines caused dangerous metals to leach into nearby waterways. Leytem’s study of lead concentrations in Mississippi River pools 11 and 12, upriver and downriver from Lock and Dam 11, found higher lead concentrations in pool 12. Concentrations were especially high throughout and at the mouth of Catfish Creek, which feeds into the Mississippi south of Dubuque in the Mines of Spain State Recreation Area, an area noted for lead mining. Itasca, Minn. — Navy combat veteran Chris Ring stepped into the headwaters of the Mississippi River on June 6, with plans to swim its length. He began his 2,552-mile swim on the 71st anniversary of D-Day and expects to finish at the Gulf of Mexico on Veterans’ Day, November 11. Ring’s swim is part of a project called “Legacy Challenge: Swim for Their Sacrifice,” to bring together and honor the sacrifice of people who have lost family members to war. For more information visit the Legacies website. Meanwhile, 80-year-old Dale Sanders of Bartlett, Tenn., started on his own Headwaters-to-Gulf paddling trip on June 4. He’s paddling with a purpose — to bring awareness to and raise money for juvenile diabetes. Sanders’ grandniece has the disease. Two cameramen and a 70-year-old friend are accompanying him. Hastings, Minn. — A new section of recreational trail in Spring Lake Park Preserve is under construction. The 4.3-mile, $8.9-million Spring Lake Regional Trail from eastern Rosemount through Nininger Township will include two bridges over ravines, scenic overlooks and prairie restorations. It will connect with the popular Schaar’s Bluff gathering center. The new section, which is scheduled to be finished in the fall of 2016, is part of the Mississippi River Regional Trail linking St. Paul to Hastings, mostly along the river. Spring Lake is a Mississippi River backwater lake upstream of Lock and Dam 2 and Hastings. For more information and a map, see the Dakota County website. Galena, Ill. — A fiery oil-train derailment near the Mississippi River on March 5 was caused by a faulty wheel, according to Matt Rose, the CEO of Burlington Northern Santa Fe railroad. The derailment took place about three and a half miles outside of the historic city of Galena. En route to Chicago, 21 train cars derailed and five caught fire. About 230,000 gallons of crude oil were removed from the damaged cars; 19,000 gallons of an oil-water mix were recovered and recycled; and about 8,000 gallons of water and other liquids used for firefighting and decontamination were recovered. The Galena derailment was the latest in a series of national disasters involving the supposedly safer model of tank, called the CPC-1232, which the rail industry adopted in 2011. Canadian Pacific (CP) and Burlington Northern Santa Fe (BNSF) railroads are making major investments to upgrade their tracks and connections in the Upper Mississippi River valley, in anticipation of a continued oil boom. According to documents filed with the Wisconsin Department of Natural Resources, BNSF has 12 rail expansion projects planned between St. Paul and the Illinois border, including four miles of new track in La Crosse, Wis. CP has four major projects this year, including an upgrade of its switch yard in La Crescent, Minn., a bridge replacement and new sidings to allow trains to pass on the line that runs south out of La Crescent through Iowa and west to Kansas City. CP anticipates its crude oil shipments will nearly double in 2015. Meanwhile, people in ­Minneapolis and the northwest suburbs are worried about plans to build a ­connector that would double train traffic through densely populated areas that include Theodore Wirth Park, Bassett Creek and the Target Center downtown. In fact, the Hennepin County Board voted with record speed to approve the county’s purchase of some land the railroads wanted to buy to make the connection. Paducah, Ky. — Commercial fishermen in Kentucky will be paid at least 15 cents a pound for Asian carp, thanks to a new subsidy from the state. Until now, some fish processors have paid just eight to 10 cents, not enough for fishermen to break even. The state will give tax incentives to at least three fisheries to process and market the carp to worldwide consumers. The state announced the subsidy as a way to reduce numbers of the fish in the Ohio River. They have pushed past Louisville and are crowding out native fish, such as bass, bluegill and crappie. The state also acknowledges a growing market for the fish, especially in Asia. 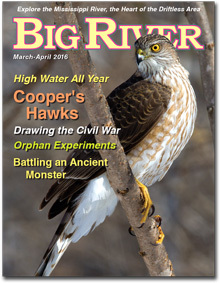 To read more Mississippi River news and stories, order this issue or find Big River at one of these retail outlets.